The holidays are always just around the corner, whether it's June or November. Birthdays, anniversaries and Christmas are all great reasons to give and receive jewelry. Today, we're here to highlight our favorite products and top sellers to help you decide which type of jewelry to give this year. titanium. 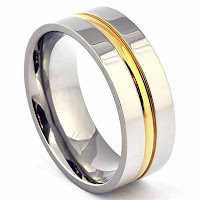 Titanium is one of the lightest metals available, and can be matte, shiny or combined with other metals to create gold rings or rings with contrasts such as beautiful inlays. Because titanium is an abundant metal, it's highly affordable. The beauty of titanium is that is doesn't look or act cheap. Titanium is resistant to corrosion even in highly abrasive environments like salt water, and it's 100 percent hypoallergenic. These rings are as versatile as they are resistant to scratches, and are guaranteed to look flawless for decades. A titanium ring is an ideal wedding or anniversary solution but it's also great for everyday wear. Our most popular titanium ring are those with gold contrast. We agree that these rings look absolutely stunning. 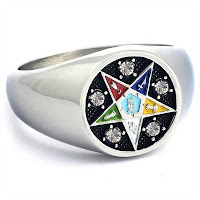 The ring pictured here is 8mm in width and can be custom engraved on the inside or the outside. Custom engraving is free. as dense as steel and 10 times as hard as 18 karat gold. That's a lot of strength in such a small piece of jewelry. We love tungsten because, like titanium, it is highly affordable but simply stunning to look at. Tungsten is incredibly versatile and can be paired with other metals to create beautiful contrasts. The black tungsten ring pictured here is our top seller, and we also simply can't get enough of it. The rose gold center stripe provides a touch of stunning brilliance and sophistication in an otherwise black ring: amazing. 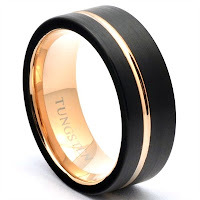 Black tungsten can be brushed to be matte, as in this ring, or polished shiny. We offer a variety of black tungsten options, as well as silver tungsten in both matte and shiny finishes, gold and silver combinations, black and gold combinations and a wide variety of inlays. to explore. From the Blue Lodge to the York Rite, we offer a wide variety of Masonic rings you won't find elsewhere. Their design is unique and each ring has been carefully crafted to be detailed flawlessly. We also offer Mason jewelry for women! Whether she's into exploring Freemasonry or simply curious, the Order of the Eastern Star ring pictured here will suit her perfectly. This ring is complemented with high-quality cubic zirconia and is made with stainless steel that's been polished to a high shine. rings such as the one pictured here, perfect for a gift to a loved one or for yourself. The affordability of this selection simply can't be beat. Whether the ring you choose is meant to be worn every day or just for fun or on special occasions, we know that it's important to you to have money left over at the end of the day. After all, romantic gestures aren't all jewelry. This ring is made with 925 Sterling Silver and has an electroplated rhodium finish. 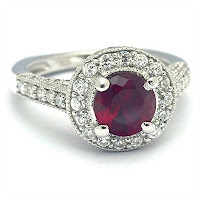 Its accent stones are colorless simulated diamonds, or CZ, and its center stone a stunning 1.5Ct red simulated ruby. we carry a variety of other jewelry options. Our most versatile selection can be found in the bracelets category, where you'll find accessories like the one pictured here. This silver magnetic clasp bracelet stands out to us because there is so much beauty in its simplicity. 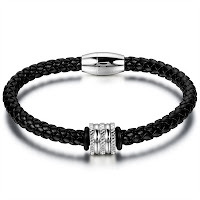 Black braided leather offers a simply yet artful look while polished stainless steel clasps give it a bold finish. This bracelet is absolutely perfect for both men and women; it is only 5.5 mm thick and has a circumference of 9".